"My grandfather’s clock was too tall for the shelf so it stood twenty years on the floor..." So went the lyrics of a song, written by Henry Clay Work, a songwriter not a clockmaker, in 1876, that was to change how America looked at tall-case clocks. The name "grandfather clock" didn’t appear until Work wrote the song, so none of the men who actually made the clocks ever knew them by that name. Tall case or grandfather clocks had their start when Christian Huygens, a Dutch scientist, applied the pendulum as the controlling element of a timepiece in 1656, inspired by the need for an accurate timekeeper to be used in making astronomical observations. The application of the pendulum to clocks revolutionized clockmaking and brought to timekeeping an accuracy that up to this time was impossible to achieve. However, it was the invention of the anchor escapement by William Clement, an Englishman in 1671, using a "seconds" pendulum, 39 inches long and vibrating through a small arc, that cleared the way for making the weight and pendulum tall case clock practical. This invention plus another, the dead beat escapement, invented by George Graham in 1715, brought about the basic clock design that few could improve on for nearly two centuries. Fundamentally, these clocks consisted of four parts: The weight, the source of power; the train, which transmitted the downward pull of the weight into the rotary velocity; the escapement, which transmitted the rotary velocity of the train into intermittent-or periodic-motion; and the pendulum, the controlling element associated with the intermittent motion of the escapement. The theory behind this was that the force of a weight is constant, while the force of spring may vary with its tension. Finally, a tall case provided for the full fall of the weight. It was decided that the beginning and end of a week was a time not likely to be forgotten. One day was added for safety. Thus, the 8-day clock. There was ample room in the tall case to permit the weight of full drop for that length of time without complicating matters with additional wheels. The earliest clocks in America were imported by the first settlers, who brought with them the skills of the Old World clockmakers. Though mainly English, but also Dutch and German from the Black Forest, and even a few Swedes, they followed the national styles that they had learned while apprentices. Therefore, there’s nothing to distinguish the Colonial American long-case clock from its European cousin. 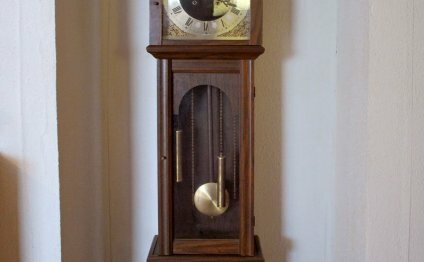 American tall case clocks were first made about 1695 in Pennsylvania and Massachusetts and a little later in Connecticut. But there were probably more tall case clocks made in Pennsylvania than anywhere else. From the early days, two distinct schools of clockmaking emerged, one centered in Philadelphia, the other in Boston. Those of the Philadelphia School spread from New York down the Delaware Valley to Virginia and Carolina. Makers of the Boston School were scattered all over New England. Each developed its own recognizable style, although the first designs were European. Clock making flourished in the Philadelphia area from the mid-1700s to the 1840s. During this time, there were over 100 clockmakers who produced a large number of clocks, most of which are still around and still running, said, Bruce R. Forman, an Allentown, Pennsylvania, clock historian. "Many local clockmakers were self-taught and had little formal education, " he said. "These were intelligent men with sound mechanical abilities." It wasn’t easy for a clockmaker to succeed financially in making every part of his clocks. In England, he would have depended on brass casters, on dial-engravers, on makers of pinion wire, and certainly on case-makers. Tall case clocks represented the collaboration of clockmakers for the movements, cabinetmakers or joiners for cases to house the movements, carvers to ornament the cases and merchant importers to obtain the movements, dials, and tools Clockmakers in the Colonies therefore tended to settle in areas with access to ports and with other craftsmen, so that they could draw on their skills. Many settled in urban areas and passed their skills onto their sons. Such was the case with Jacob Hagey, who trained his son Jacob, Jr. in the 19th century. George Hagey did the same for his son John. Most built grandfather clocks, a smaller version of which became known later as a grandmother clock. Clocks often had 24-hour faces with a sweep second hand and "monkey wheel" escapement. On early clocks, only one of the winding holes, the one on the right, was functional. It was used for winding the clock while the other nonfunctional one presented a point of balance. The cost of a typical grandfather clock in the 1780s was .50, and few were produced compared to other furniture forms in the 18th century. Until the Revolutionary War, tall case clocks closely resembled their English cousins. But when the war ended in 1783, casemakers began introducing their own styles which were firmly established by the end of the century. Those made to order in the 18th century were of superior craftsmanship and design. Originally, cases for tall clocks were made by coffin makers and, therefore, a case became known as a sarcophocus. During the mid-to late 1700s, ninety percent were made of walnut, but after 1800, most were made of cherry and mahogany in the prevailing styles of the period-Sheraton, Hepplewhite, Chippendale, Queen Anne and Empire. The power to move the cogs and wheels of this type of clock was produced by heavy weights that had to be wound up daily. The mechanism was encased in a wooden cabinet with a dial that told the time. Many of the dials illustrated the phases of the moon, the month and sometimes the day or the week. After the Declaration of Independence in 1776, the Colonists found themselves increasingly short of raw materials, including copper and zinc for the brass clock movements. Makers turned to wood for the plates and the toothed wheels of clocks, like the clockmakers of the Black Forest of Germany in the 18th century. From this time until about 1810, almost all American tall-case clocks were made by hand by clockmaker-carpenters. "The cabinets that held the works and dials, " said Forman. "Often the works, themselves, were imported from England until the supply was cut off by the War of 1812. The clockmakers then turned to local craftsmen to produce the needed components. After 1812, tall-case clocks sold for between $14 and $44." By this time, a decline, which had begun in 1805, affected the making of tall case clocks until their eventual demise in the 1840s after 150 years. However, some were made after that period but were mostly mass produced and not of the same quality as the older ones. The best clocks were made in Philadelphia. Scroll pediments atop a straight cornice and carved rosettes were hallmarks of Philadelphia clockcases. Other features included carved flame and urn finials, broken arch pediment with carved rosettes, floral, leaf, and a pierced shell carving in high relief, C- and S-scroll blind foot carving and ogee-bracket feet. However, the most common style of American long-case clock was very similar to the English provincial style after 1750, with swan-neck pediments on the hoods. "Does Anybody Really Know What Time It Is?" is a song written and sung by Robert Lamm while in the rock band Chicago and recorded for their debut album The Chicago Transit Authority (1969).